Fisherman’s Wharf is San Francisco’s most endearing tourist trap and top destination, complete with picture-perfect seaside scenery and tempting gourmet delights. Cioppino (Fish stew), fresh-caught crab, clam chowder and sourdough bread are all specialties of this historic fishing port. You’ll explore these delicacies on this Fisherman’s Wharf Food Tour. These famous foods literally give visitors a taste of the city’s heritage, going back to time of the Gold Rush when Italian immigrants came here to work as fishermen. On this self-guided Fisherman’s Wharf food tour, you’ll sample the finest local foods while admiring the Wharf’s charming ambience. Start by sampling Cioppino, a San Franciscan Italian-style seafood dish at Alioto’s Restaurant. Then visit Boudin Bakery to see where sourdough bread was invented. Next, stop by a favorite fish shack to enjoy delicious fish & chips. The progressive multiple-course feast is capped off with an Irish Coffee Cocktail at the legendary Buena Vista Café. 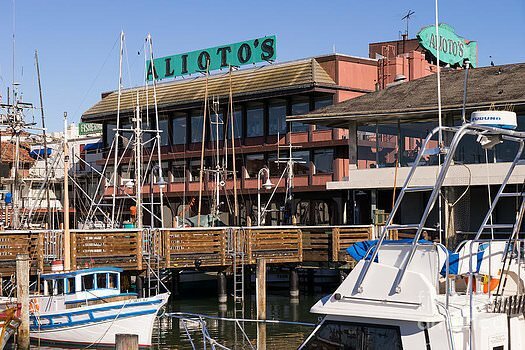 Begin your Fisherman’s Wharf walking tour at Alioto’s Restaurant, a traditional restaurant that has been serving Italian-style seafood since 1925. Alioto’s overlooks the picturesque little marina of Fisherman’s Wharf where a small fleet of vintage Italian fishing boats (called felucca) are docked. Notice how each boat’s hull is painted with the name of a Catholic saint. Try to imagine the Italian immigrants who came here in the 1840s; they would sail around the San Francisco Bay in their fishing boats while singing Italian opera songs. Be sure to sample Alioto’s Cioppino, an authentic dish based on recipes that Italian fishermen would have enjoyed during the Gold Rush era. Cioppino is a seafood stew that includes crab, shrimp, clams and other fish, cooked in a tomato-based sauce with onions, garlic, herbs and wine. Learn more about the history of Cioppino and how it was invented in San Francisco Here. After eating at Alioto’s, take a stroll down Fisherman’s Wharf to visit TwoXSea at Pier 45 (Shed D3). A supplier of sustainably sourced seafood, TwoXSea has the highest standards of environmentally conscious fishing – ensuring that fishermen do not overfish or harm the ocean habitat. For a fun detour on the way back along Fisherman Wharf, peek into the Musée Mécanique and play a game of pinball or listen to an old-time electric piano. This free museum dazzles visitors with its amazing collection of vintage arcade games and mechanical musical instruments. From Alioto’s, walk half a block to Boudin Bakery, the birthplace of San Francisco sourdough bread. This celebrated loaf was created in the 1840s by gold miners who were attempting to bake a traditional French baguette. However, San Francisco’s cool climate, misty ocean air and foggy nights contributed to the yeast starter turning sour. Initially it was believed that the bread could only be reproduced within a 50-mile radius of the city. 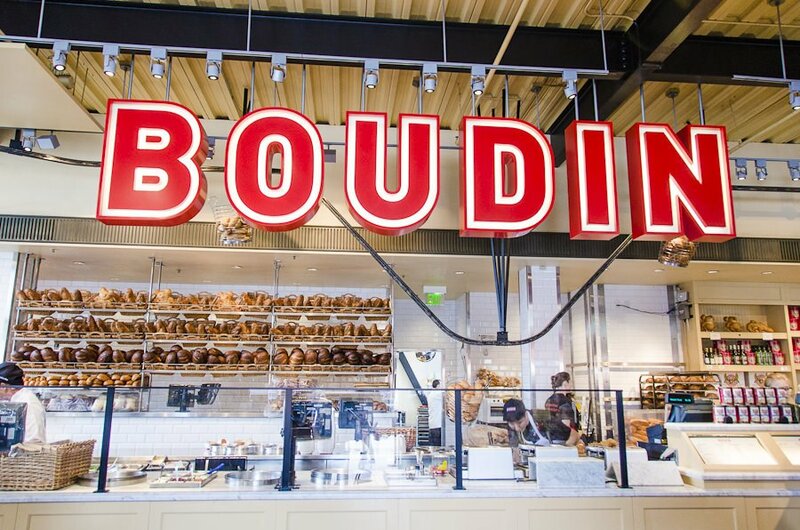 To learn more about the history of sourdough bread, visit the Boudin Bakery and Museum and sample a baguette while you’re there. The museum includes educational interactive exhibits and a floor-to-ceiling windows with view into the kitchen, so travelers can watch the bakers in action. Learn more about the history of Sourdough Bread Here. After discovering the history of San Francisco sourdough bread, circle back on Jefferson Street towards Jones Street. This traditional fish shack is a great place to sample authentic British-style fish & chips or Baja-style fish tacos. 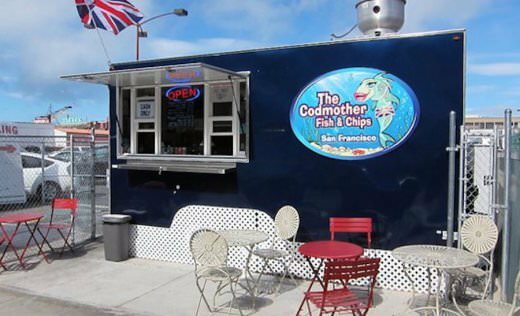 The Codmother uses fresh sustainably sourced seafood and other high-quality ingredients. Customers order at the counter and may eat at one of the tables in front of the counter or take the food to go. On a sunny day, head over to Aquatic Park located at the end of Jefferson Street. Find a spot on the grass or on a bench near the small sandy beach. The Aquatic Cove is a National Historical Park where several 19th-century ships are docked. 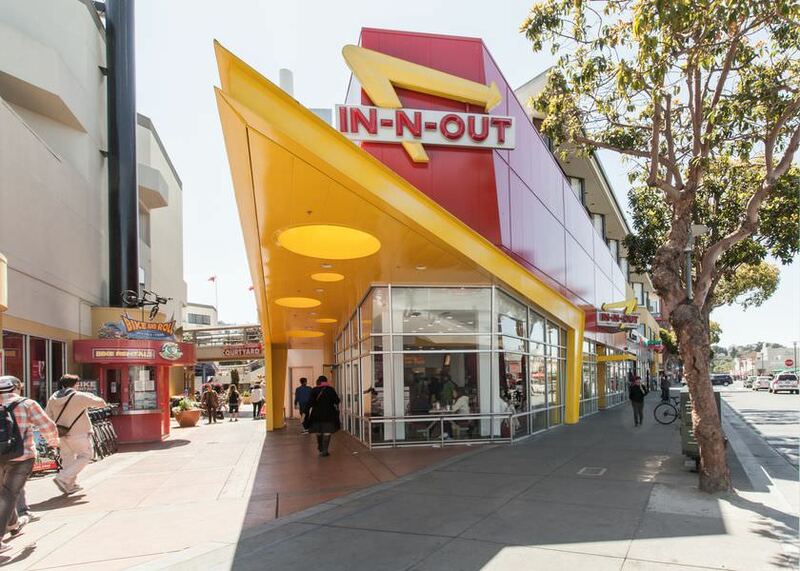 For those who love old-fashioned hamburgers and thin-cut French fries, In-N-Out Burger is another great option at Fisherman’s Wharf. In-N-Out Burger is much more than an ordinary fast-food restaurant. The company has been preparing the highest quality hamburgers since 1945. Hamburger patties are prepared in-house and never frozen. The French fries are made daily from fresh potatoes and are perfectly crisp. In-N-Out fries are great with The Codmother’s fried fish (without the chips). 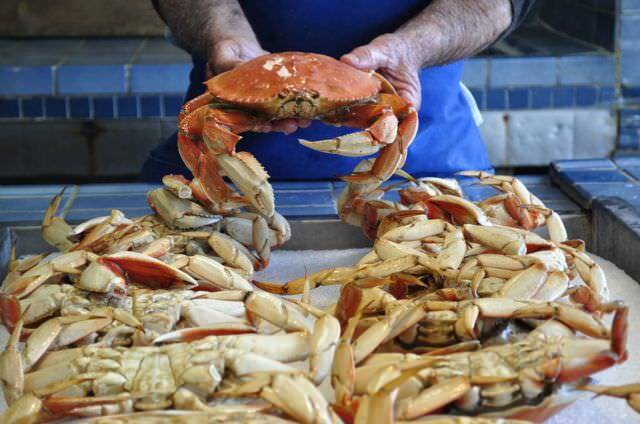 On your way to the Buena Vista Cafe, stop by the Alioto-Lazio Fish Company to see the live crab swimming around. Located at 440 Jefferson Street, this is still a family-run operation. You can even ship crab to your door! Conclude your Fisherman’s Wharf walking tour in style at the Buena Vista Café. Located at the corner of the Powell-Hyde Cable Car line’s last stop, this legendary San Francisco bar is famous for its Irish Coffee Cocktail. The Buena Vista Café was the first place to serve Irish Coffee in America in 1952. Then-owner of the Buena Vista, Jack Koeppler, traveled to the Shannon Airport in Ireland where he perfected his Irish Coffee Cocktail techniques by learning how to make the whipped cream float on top. Today bartenders still follow the same methods to create this favorite cocktail: lining up rows of fluted glasses along the bar, dumping in the ice, pouring the hot coffee, dropping in the sugar cubes, then topping with jiggers of whiskey and whipped cream. The Buena Vista Café nowadays serves more Irish whiskey than anywhere else in the world! Tullamore Dew Irish whiskey and locally produced Peerless Coffee give the Buena Vista’s Irish Coffee Cocktail its uniquely smooth, nutty and rich flavor. 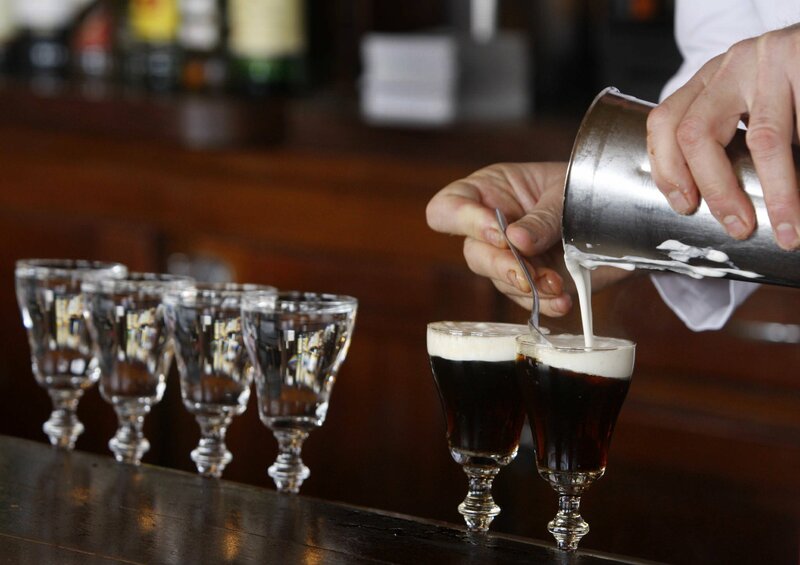 Learn more about the history of the Irish Coffee Here. 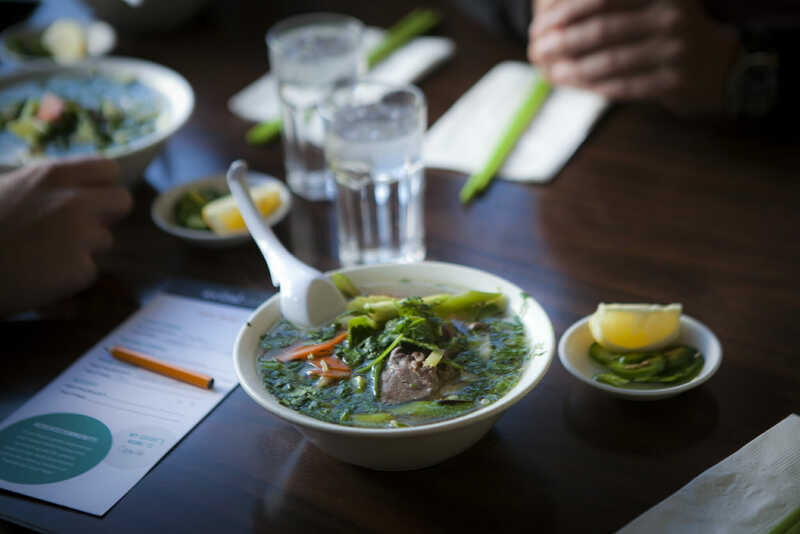 Want to learn more about dishes invented in San Francisco and culinary history? 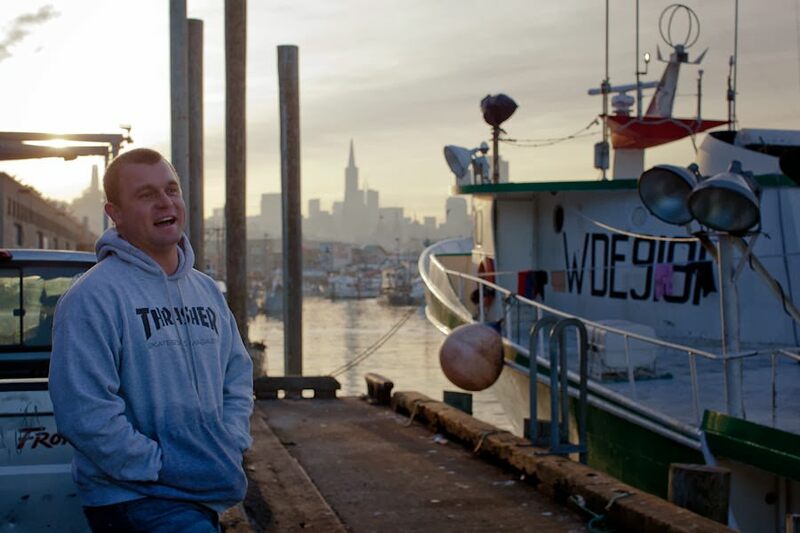 Join us on our North Beach Food Tour to learn about the Italian Fisherman.